Keeping all your separate pill bottles in one place can be tough. Once you put them in your purse or bag, it seems impossible to find the right ones at the right time. Now you can keep up to three different kinds of pills in one place! This adorable little pill case is the perfect thing for keeping all your pills in one spot. It measures at about 3.25" W x 2.5" H x 1.5" D. It is perfect for keeping in a bag or purse. 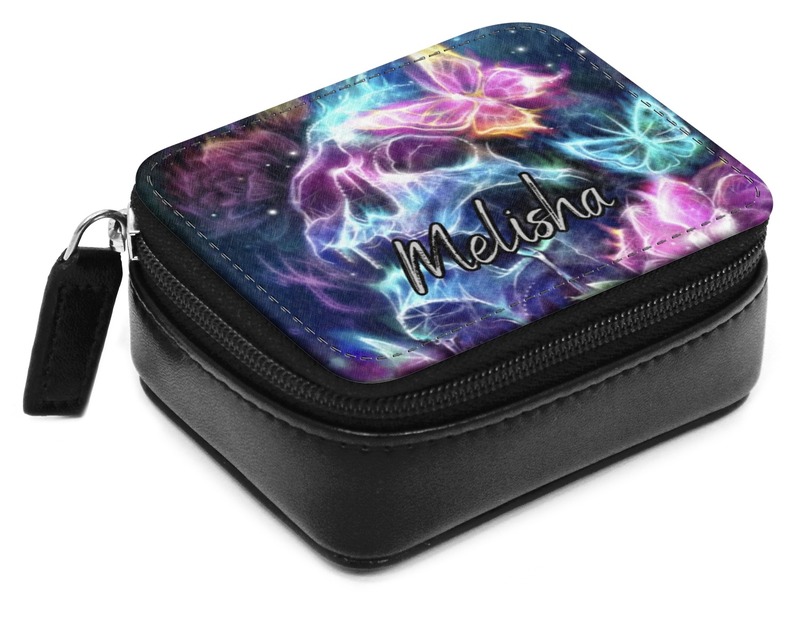 It is made of a black leatherette material and has your very own design printed on the front, which is a canvas like material. The zipper close goes around three sides of the pill case to keep your medicine safe and sound inside. The inside is a nice cushioned area with three pill bottles that come with it. This will make your life so much easier when it comes to taking medicine. Go into our design center to find the perfect thing to put on your pill case. Search through our monograms, fonts, frames, patterns, and more! Find exactly what you want! Even upload your own artwork or picture. Have fun designing and call if you have any troubles. First get a travel dopp kit to put all your toiletries in. Next, grab a set of travel bottles to put shampoos, gel, and more in. Don't leave without checking our the rest of the Travel Accessories section where you'll even find makeup bags and documents holders! It was perfect! Love the fact that I could upload a photo of exactly what i wanted. Perfect!!!! Just what I wanted .... mine got stolen so I had to replace it. Very cool! Great work, great quality!